Joint flight with Vostok 5. First woman in space. Tereshkova did not reply during several communications sessions. To this day it is not known if she was paralyzed with fear, or if there was an equipment failure. AKA: Chayka (Seagull). Launched: 1963-06-16. Returned: 1963-06-19. Number crew: 1 . Duration: 2.95 days. The only Russian woman to go into space until Svetlana Savitskaya 19 years later. On its first orbit, Vostok 6 came within about five km of Vostok 5 , the closest distance achieved during the flight, and established radio contact. Flight objectives included: Comparative analysis of the effect of various space-flight factors on the male and female organisms; medico-biological research; further elaboration and improvement of spaceship systems under conditions of joint flight. It was Korolev's idea just after Gagarin's flight to put a woman into space as yet another novelty. Khrushchev made the final crew selection. Korolev was unhappy with Tereshkova's performance in orbit and she was not permitted to take manual control of the spacecraft as had been planned. Recovered June 19, 1963 8:20 GMT. Landed 53:16 N 80:27 E.
The launch was excellent, the communications good, I could hear all the calls from the ground. The G forces were weak, under 5.0. After orbital insertion I could see the earth through the Vzor and the porthole. Through the right porthole I could see the third stage of the rocket. I had no problem with zero-G. In the earth's shadow I could communicate directly with Yastreb (Bykovsky in Vostok 5). I saw stars on the night side and mistook the third magnitude star Vega for Venus. When first trying manual orientation of the spacecraft, I closed the cotton (?) and could feel an explosion on the ejection of the can. The first attempt at manual orientation was unsuccessful. I was not expecting the instruction from No. 20 (Korolev) to test manual orientation on the 38th orbit. When I tried again on the 45th orbit, I was able to orient the spacecraft for landing within twenty minutes. There was no failure of the orientation system. The equipment was all right, but I didn't need the Globus or the other instruments. I filmed cities, forests, and rivers. I didn't complete the biological experiment - I couldn't reach the equipment. The dosimeter stayed at zero throughout the flight. The hygienic napkins had a bad odor and were very small. I used them to clean my teeth. Using the color filters I could distinguish the colored bands of the horizon. I could see fires in South America, and cities at night. The light of the moon on the dark side of the earth was lovely. I tried to but could not observe the solar corona. I didn't release myself from the seat on the first day. On the second day I felt a nagging pain on my right shin, which became very disturbing by the third day. Communications were all right. When first turning on the UHF all I got was static, and the static was always worse in the equatorial regions. I heard Vesna-1 and Vesna-4 well in the southern hemisphere. I had excellent communications with Yastreb on the first orbit, but these faded and by the second day it was no longer possible to talk directly with each other - we had to have our communications relayed through the earth stations. Zero-G was pleasant, no problems and I enjoyed floating. The bread was awful, too dry, I didn't eat it. I mainly ate the black bread and tubed onions. The water was cold and refreshing. I threw up once, but it was due to the food and not due to vestibular problems. The environmental control system worked as designed. My mental state was the same as one earth. I took two photometric measurements. Writing was no problem. The spacecraft started solar orientation for retrofire on the dark side of the earth. I could hear the TDU retrorocket fire. I could feel the G forces against my spine during retrofire. The service module jettisoned cleanly, with no movement. I took 8 G's on reentry. Through the porthole I could see glowing flakes flying by from the burning exterior of the capsule. After the G's subsided there was a lot of smoke and heat in the spacecraft cabin. Ejection came quickly and correctly. After my parachute opened I could see the capsule below. The capsule, seat, and I came down together. It was not possible to control the canopy of my parachute and I landed on my back. People came running and stood by to assist me. The capsule landed about 400 m away. After an hour an aircraft flew over and two parachutists were dropped. After three hours I was able to reach a telephone and called Khrushchev and reported the successful completion of the flight. Family: Manned spaceflight. People: Tereshkova. Country: Russia. Spacecraft: Vostok. Launch Sites: Baikonur. Agency: Korolev bureau. Gagarin out of the hospital. - . Nation: Russia. Related Persons: Keldysh, Korolev, Tereshkova, Vershinin. Program: Vostok. Flight: Vostok 6. Korolev says he will need 28 pilot-cosmonauts and 22 specialist cosmonauts (engineers, scientists, etc) in the period 1962-1964. This is to include five women. Kamanin had already brought up the concept of a female spaceflight to Vershinin, Korolev, and Keldysh immediately after Gagarin's flight. He believed it was their patriotic duty to beat the Americans in putting a woman in space, and he wanted to find a female cosmonaut who would be a dedicated Communist agitator in the same class as Gagarin or Titov. 1962 January 16 - . Female cosmonauts - . Nation: Russia. Related Persons: Borzenkova, Kuznetsova, Kvasova, Ponomaryova, Sokolova, Solovova, Solovyova, Tereshkova, Yefremova, Yerkina. Flight: Vostok 6. Yesterday DOSAAF sent the files of 58 female cosmonaut candidates, pilots and parachutists, of which 40 are to come to Moscow for interviews. Kamanin reviews plans to reorganise TsPK - there are to be 250 staff, 17 of which are cosmonauts..
1962 January 18 - . Cosmonaut inteviews - . Nation: Russia. Related Persons: Borzenkova, Kuznetsova, Kvasova, Ponomaryova, Sokolova, Solovova, Solovyova, Tereshkova, Yefremova, Yerkina. Flight: Vostok 6. On this day Kamanin and his staff interviewed 23 of the 58 female cosmonaut candidates. His first impression is that they were all unqualified. What is needed is women who are young, physically fit, and have also completed flight and parachute training of at least five to six months duration. 1962 February 28 - . Female cosmonaut candidates ranked. - . Nation: Russia. Related Persons: Kuznetsova, Kvasova, Sokolova, Solovova, Solovyova, Tereshkova, Yefremova. Flight: Vostok 6. Kamanin sees Solovyova, Tereshkova, and Kuznetsova as most likely to be first in space. In the second rank he puts Yefremova, Kvasova, and Solovova, and then Sokolova in the third rank..
1962 June 25 - . Female cosmonaut space suit - . Nation: Russia. Related Persons: Alekseyev, Semyon. Flight: Vostok 6. Spacecraft Bus: Sokol. Spacecraft: Sokol SK-1. Kamanin meets with Alekseyev on the design of a space suit for the female cosmonauts. He advises the designer of the absolute need to have them finished by the end of the year and provides the measurements of the five ladies. Alekseyev advises he cannot possibly complete the suits earlier than the first quarter of 1963. He won't be pressured in the absence of an official government decree -- at the same time that Korolev and Smirnov are pressing the Central Committee for permission to make a female flight in September 1962!! 1962 November 12 - . Plans for Vostok female cosmonaut flight discussed. - . Nation: Russia. Program: Vostok. Flight: Vostok 5, Vostok 6, Vostok 6A. A meeting was held to discuss alternatives for the next two Vostok flights. Alternatives were simultaneous flight of two capsules, each with a female cosmonaut; or one female flight and a male 5 to 7 day flight. The flight would occur no earlier than April 1963. 1962 November 19 - . 1962 November 29 - . Final tests for female cosmonauts. - . Nation: Russia. Program: Vostok. Flight: Vostok 5, Vostok 6, Vostok 6A. Academic examinations were completed of the female cosmonaut corps. Kuznetsova had missed to much training and was excluded from even taking the test. Of the four women remaining, only Tereshkova did not receive the highest marks. This was attributed to her being too nervous and excited during the examination. All were given the rank of Junior Lieutenant in the VVS Soviet Air Force. Kamanin considered Tereshkova as the leading candidate for the first flight, with Solovyova as her back-up. In personality they were equivalent to Gagarin/Nikolayev - indeed, Tereshkova was considered 'Gagarin in a skirt'. Ponomaryova and Yerkina were equal candidates for the second female Vostok flight. The group would go to a resort in the Urals from 30 November to 10 January. The final decision as to which one would fly would only be made 3 or 4 days before the flight. 1963 February 16 - . Plethora of projeects - . Nation: Russia. Related Persons: Vershinin. Program: Vostok, Soyuz. Flight: Vostok 5, Vostok 6, Vostok 6A, Vostok 7. Spacecraft: Raketoplan, Soyuz A, Vostok. Vershinin says the Soviet Union can't work on the Vostok, Soyuz, and Raketoplan manned spacecrafft all at the same time. But he still wants fo fly four Vostoks by the end of the year..
1963 April 6 - . The General Staff considers the topic of spaceflight and is opposed to greater VVS participation. - . Nation: Russia. Flight: Vostok 5, Vostok 6. They are not against the flight of four Vostoks in 1963, though..
1963 April 13 - . Decree issued for four Vostok flights in 1963. - . Nation: Russia. Flight: Vostok 5, Vostok 6. Spacecraft: Vostok. Decree issued by the Soviet ministers and Central Committee setting out four Vostok flights in 1963. Two are to be launched by 15 June. .
At a meeting with the VVS, Korolev outlines his revised plans for the next fights. - . Nation: Russia. Related Persons: Korolev. Flight: Vostok 5, Vostok 6. He plans a male flight for 8 days, during which a woman would be sent aloft for 2 to 3 days..
1963 April 19 - . Cosmonaut training for Vostok 5/6. - . Nation: Russia. Related Persons: Bykovsky, Khrunov, Leonov, Tereshkova, Volynov. Flight: Vostok 5, Vostok 6. Spacecraft: Vostok. It is clear that the female cosmonauts are trained and ready for an August flight, and the men (Bykovskiy, Volynov, Leonov, Khrunov) can complete training by that date. The male cosmonauts object to spending 7 to 8 days in a spacesuit in the ground spacecraft mock-up as required by the flight doctors. They don't want to spend more than 3 to 4 days. 1963 May 7 - . Yerkina excluded from Vostok 6 - . Nation: Russia. Related Persons: Yerkina. Flight: Vostok 6. Spacecraft: Vostok. Yerkina was excluded from Vostok 6 due to her performance during the three day test in the hot mock-up. She took off her boots after one day, and ate only three rations in three days. She was weak and fainted after coming out of the spacecraft. .
1963 May 11 - . Vostok 5 / Vostok 6 Planning - . Nation: Russia. Related Persons: Bykovsky, Keldysh, Khrunov, Korolev, Leonov, Ponomaryova, Rudenko, Solovyova, Tereshkova, Volynov, Yerkina. Flight: Vostok 5, Vostok 6. Spacecraft: Vostok. Korolev reports still problems with components of the electrical system from the Kharkov factory -- the same problems that existed in 1962. The cosmonauts will go to Tyuratam on 27/28 May, with launch planned for 3/5 June. Bykovskiy is named prime for Vostok 5, with Volynov his backup. Tereshkova is named prime for Vostok 6, with Solovyova and Ponomaryeva both as her backups. This selection is however made despite strong support for Ponomaryeva as prime by Keldysh and Rudenko. 1963 May 13 - . Korolev fights excessive VVS staff at Tyuratam. - . Nation: Russia. Related Persons: Alekseyev, Semyon, Bykovsky, Cooper, Korolev. Flight: Mercury MA-9, Vostok 5, Vostok 6. Spacecraft Bus: Sokol. Spacecraft: Sokol SK-1. 1963 May 14 - . Tereshkova and Solovyova rated most ready to fly on Vostok 6. - . Nation: Russia. Related Persons: Bykovsky, Ponomaryova, Solovyova, Tereshkova, Yerkina. Flight: Vostok 5, Vostok 6. Spacecraft: Vostok. Tereshkova and Solovyova are most ready to fly and will be sent to Fedosiya for sea training first. Ponomaryova and Yerkina will follow tomorrow. Bykovskiy started his run in the hot mock-up at 10:00 am. .
1963 May 21 - . The cosmonauts are informed of the selections for the Vostok 5/6 flights. - . Nation: Russia. Related Persons: Bykovsky, Khrunov, Korolev, Leonov, Ponomaryova, Solovyova, Tereshkova, Volynov, Yerkina. Flight: Vostok 5, Vostok 6. Spacecraft: Vostok. Korolev asks Ponomaryova why she is so sad - 'I am not sad, but serious, as always'..
1963 May 25 - . VPK meets to approve plans for Vostok 5 and 6 flights. - . Nation: Russia. Flight: Vostok 5, Vostok 6. Spacecraft: Vostok. It was proposed that Vostok 5 carry a small 1.5 kg optical telescope to allow better visual observations outside of the spacecraft..
Kamanin and the VVS contingent arrive at Tyuratam for the launch campaign. - . Nation: Russia. Flight: Vostok 5, Vostok 6. 1963 May 28 - . Cosmonaut's parachute trainer Nikitin killed in an accident. - . Nation: Russia. Related Persons: Korolev, Rudenko. Flight: Vostok 5, Vostok 6. He tangled in the air with another member of a group jump, Aleksei Novikov. Both were killed. The Vostok 5 and 6 launch vehicles and spacecraft are both in the MIK assembly wall. Work began on them two weeks ago. Nevertheless Korolev is not happy with the results. He wants the tests run over from the start. Round-the-clock work begins from this day. The bad weather and the news of Nikitin's death produce an atmosphere of gloom. Nikitin's funeral is scheduled for 30 May. Therefore the cosmonauts have delayed their departure in order to attend the funeral and will not arrive at Tyuratam until 31 May. Kamanin was very worried about the effect of Nikitin's death on the female cosmonauts' nerves. The final decree set the launch dates as 2/3 June, with landing on 7/8 June. Kamanin gets into a heated argument with Rudenko, who wants to fly all of the cosmonauts to Tyuratam on a single aircraft. He doesn't see what the big deal is -- after all, state ministers fly together all the time. 1963 June 1 - . Cosmonauts and brass arrive at the cosmodrome for the Vostok 5/6 launch. - . Nation: Russia. Flight: Vostok 5, Vostok 6. Spacecraft: Vostok. A meeting is held to discuss emergency recovery of the Vostoks. There is no realistic chance of their survival if they land at sea in the South Atlantic, Pacific, or Antarctic Oceans, however plans must be made. Several ships and three to four Tu-114 aircraft would be required to have any realistic chance of recovery. However these are not available. 1963 June 3 - . Vostok 5/6 Flight Preparations - . Nation: Russia. Related Persons: Bykovsky, Korolev, Ponomaryova, Solovyova, Tereshkova, Volynov. Flight: Vostok 5, Vostok 6. Spacecraft: Vostok. At 9 am Tereshkova, Solovyova, and Ponomaryova practice donning and doffing their space suits. Bykovskiy and Volynov prepare their ship's logs. Korolev discusses plans for tests of the cosmonaut's ability to discern objects from space. Colonel Kirillov completes preparation of the spacecraft for flight. 1963 June 4 - . The State Commission for Vostok 5/6 launches meets. - . Nation: Russia. Related Persons: Bykovsky, Tereshkova. Flight: Vostok 5, Vostok 6. Spacecraft: Vostok. All is ready, but the wind is predicted to by 15 to 20 m/s on 7 June. The launch vehicle cannot be launched in winds over 15 m/s. Bykovskiy and Tereshkova are confirmed as the crew for 8 and 3 day flight durations. When they return to earth, a new and difficult life as celebrities will begin for them -- they will be known all over the world. Vostok 5/6 Flight Preparations - . Nation: Russia. Related Persons: Tereshkova. Flight: Vostok 6. Spacecraft: Vostok. A review of the spacecraft radio problems shows that the rejection rate for production equipment is 6% against 2% guaranteed by 5-GURVO. Tereshkova sits in the Vostok 6 spacecraft, and makes a good impression on the technicians. .
1963 June 10 - . Vostok 5 scrubbed due to solar flares. - . Nation: Russia. Related Persons: Keldysh, Korolev. Flight: Vostok 5, Vostok 6. Spacecraft: Vostok. The launch of Vostok 5 is set for 11 June. Final training and consultations are under way. Korolev is not happy with the condition of the spacecraft. At 22:30 in the evening the launch is scrubbed when Keldysh calls from Moscow and advises excessive solar flare activity is expected. Keldysh will review the data tomorrow and advise if it really poses a danger to the cosmonauts. 1963 June 11 - . Vostok 5 slipped to 14 June - . Nation: Russia. Related Persons: Bykovsky, Korolev, Tereshkova. Flight: Vostok 5, Vostok 6. Spacecraft: Vostok. The cosmonauts spend the day on the beach. Tereshkova sits a long time with Korolev on the balcony on the second floor of the house on the river. He interviews here thoroughly to make sure she is ready for the flight. The State Commission meets at 17:00. The expected solar flare did not occur, but the Crimean Observatory claims the risk will remain high. The decision is made to defer the launches to 14/15 June. 1963 June 14 - . Tereshkova meets with the command staff at 17:00, followed by dinner. - . Nation: Russia. Related Persons: Tereshkova. Flight: Vostok 6. Tereshkova meets with the command staff at 17:00, followed by dinner. She has a good appetite and is ready to go for her space flight..
1963 June 16 - . Vostok 5 day 3 / Vostok 6 launch - . Nation: Russia. Related Persons: Bykovsky, Gagarin, Khrushchev, Korolev, Tereshkova. Flight: Vostok 5, Vostok 6. Spacecraft: Vostok. Bykovskiy slept well, his pulse was 54. The ground station could observe him via television - he made no motion while sleeping. On orbit 23 the cosmonaut was to communicate with earth, but no transmissions were received. Gagarin asks him why, and Bykovskiy simply replies that he had nothing to say and had already had a communications session with Zarya-1. But this was not true, they also reported no transmissions. At 07:00 he is asleep again, pulse 48-51. An hour later Korolev calls and discusses the impending launch of Vostok 6, 11 hours later. At 12:15 Tereshkova is on the pad. Her pulse skyrockets to 140 aboard the elevator to the top of the rocket. 10 to 15 minutes later she is in the capsule and testing radio communications with ground control. There are no problems with the spacecraft or launch vehicle during the countdown - everything goes perfectly, just as it did on 12 April 1961 when Yuri Gagarin became the first man in space. Tereshkova handles the launch and ascent to orbit much better than Popovich or Nikolayev according to her biomedical readings and callouts. Kamanin feels reassured that it was no mistake to select her for the flight. The launch of the first woman into space creates a newspaper sensation throughout the world. Direct orbit-to-orbit communications between Tereshkova and Bykovskiy are excellent. She talks to Khrushchev and the Soviet leadership soon thereafter. This was truly a great victory for Communism! 1963 June 16 - . 09:29 GMT - . Launch Site: Baikonur. Launch Complex: Baikonur LC1. LV Family: R-7. Launch Vehicle: Vostok 8K72K. Vostok 6 - . Call Sign: Chayka (Seagull ). Crew: Tereshkova. Backup Crew: Ponomaryova, Solovyova. Payload: Vostok 3KA s/n 8. Mass: 4,713 kg (10,390 lb). Nation: Russia. Related Persons: Korolev. Program: Vostok. Class: Manned. Type: Manned spacecraft. Flight: Vostok 6. Spacecraft: Vostok. Duration: 2.95 days. Decay Date: 1963-06-19 . USAF Sat Cat: 595 . COSPAR: 1963-023A. Apogee: 166 km (103 mi). Perigee: 165 km (102 mi). Inclination: 64.90 deg. Period: 87.80 min. Joint flight with Vostok 5. First woman in space, and the only Russian woman to go into space until Svetlana Savitskaya 19 years later. On its first orbit, Vostok 6 came within about five km of Vostok 5 , the closest distance achieved during the flight, and established radio contact. Flight objectives included: Comparative analysis of the effect of various space-flight factors on the male and female organisms; medico-biological research; further elaboration and improvement of spaceship systems under conditions of joint flight. It was Korolev's idea just after Gagarin's flight to put a woman into space as yet another novelty. Khrushchev made the final crew selection. Korolev was unhappy with Tereshkova's performance in orbit and she was not permitted to take manual control of the spacecraft as had been planned. 1963 June 19 - . Vostok 5 and Vostok 6 return to earth - . Nation: Russia. Related Persons: Bykovsky, Korolev, Tereshkova. Flight: Vostok 5, Vostok 6. Spacecraft: Vostok. In the morning Tereshkova manually oriented the spacecraft for re-entry easily and held the position for 15 minutes. She was very happy with the result. At 9:00 the state commission took their places in the command post. At 9:34:40 the retrofire command was sent to Vostok 6. After a few seconds, telemetry was received indicating that the engine burn was proceeding normally. The nerves of the commission members finally settled down, but Tereshkova did not call out each event as required. No report of successful solar orientation was received, no report of retrofire, and no report of jettison of the service module. Things remained very tense in the command post - no communications were received from the capsule at all. Knowledge that the spacecraft was returning normally were only received via telemetry, including the signal that the parachute opened correctly from above the landing site. Both spacecraft landed two degrees of latitude north of the aim point. It was calculated that this could have occurred by duplicate landing commands having been sent, but such a failure could not be duplicated in post-flight tests of ground equipment. Many errors occurred in the entire landing sequences, including actions of the VVS recovery forces. The conditions of the cosmonauts were only reported several hours after their landings. Big crowds gathered at both landing sites. Bykovskiy spent the night in Kustan, then left on 20 June aboard an Il-14 for Kuibyshev. Tereshkova spent her first night in Karaganda, then flew in an Il-8 to Kuibyshev. Many congratulatory phone calls were received from the Soviet leadership. Korolev declared he had no longer had the time to personally direct Vostok flights and wanted to hand the spacecraft over to the military for operational use. He could then concentrate on development of the Soyuz and Lunik spacecraft. Landing of Vostok 6 - . Return Crew: Tereshkova. Nation: Russia. Related Persons: Tereshkova. Program: Vostok. Flight: Vostok 6. Vostok 6 landed at 08:20 GMT at 53:16 N 80:27 E..
Vostok 5/6 cosmonaut debriefing - . Nation: Russia. Related Persons: Bykovsky, Korolev, Tereshkova. Flight: Vostok 5, Vostok 6. Spacecraft: Vostok. Korolev, Tyulin, and Rudenko left Tyuratam aboard an An-12, followed by 60 others (cosmonauts, officers, engineers) aboard an An-10. General Goreglyad requests that 'extraneous' staff remain in Kuibyshev, while the rest will proceed on to Moscow with Bykovskiy and Tereshkova. The aircraft arrive at 11:30 in Kuibyshev, then go to the debriefing building on the Volga river. There the debriefing of the two cosmonauts began at 13:00. After the debriefings, in the evening, Korolev took the cosmonauts for a trip on the Volga. Kamanin was infuriated - partying would ruin the post-flight medical tracking. 1963 June 21 - . Vostok 5/6 cosmonaut debriefing - . Nation: Russia. Related Persons: Bykovsky, Tereshkova. Flight: Vostok 5, Vostok 6. Spacecraft: Vostok. Tomorrow morning the entire entourage would depart for Moscow. But on this day at the house on the Volga the cosmonauts were subjected to the attentions of seventy doctors, 100 correspondents, and a large additional number of KGB supervisors, military officers, and engineers. Tereshkova looked fresh and her first press conference with sixty correspondents went well - she made no big errors. 1963 June 22 - . Vostok 5/6 cosmonaut welcome in Moscow - . Nation: Russia. Related Persons: Bykovsky, Khrushchev, Tereshkova. Flight: Vostok 5, Vostok 6. Spacecraft: Vostok. The big day for the cosmonauts. Departure for Moscow was scheduled for 10:30, with the meeting with Khrushchev at Vnukovo planned for 15:00. A sensitive issue - who would exit the aircraft first - Tereshkova, the main celebrity, or Bykovskiy, the senior cosmonaut and the first one launched? An enormous motorcade takes the entourage from the house on the Volga to the airport. Tereshkova and Kamanin are in the lead automobile, followed by Bykovskiy in the second, then the correspondents and so far in others, at five minute intervals. Huge crowds all along the route chant 'Valya! Valya! During the flight to Moscow Kamanin goes over Tereshkova's speech with her. When she and Bykovskiy get off the plane and march up to the tribune, a completely new life will begin for them. After the immense reception at the airport, they go with the leadership to a huge rally at Red Square. Controversy over Tereshkova's performance - . Nation: Russia. Related Persons: Bykovsky, Keldysh, Korolev, Tereshkova, Tyulin, Yazdovskiy. Flight: Vostok 5, Vostok 6. The cosmonauts are prepared by Keldysh, Tyulin, and Korolev for their first big press conference. 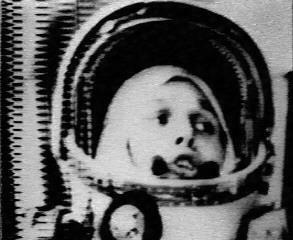 Yazdovskiy has inserted a paragraph in the official press release about Tereshkova's poor emotional state while in space. He claims she experienced overwhelming emotions, tiredness, and a sharply reduced ability to work and complete all of her assigned tasks. Kamanin takes him aside and asks him not to exaggerate her difficulties during the flight. She only had tasks assigned for the first day. When the flight was extended for a second, and then a third day, there was essentially nothing for her to do. The ground command did nothing to support her during those additional days. She certainly was never tired, never objected, but rather did all she could to complete fully the flight program. 1963 June 25 - . Vostok 5/6 returned cosmonauts traditional meeting with Korolev - . Nation: Russia. Related Persons: Bykovsky, Korolev, Tereshkova. Flight: Vostok 6. Spacecraft: Vostok. The returned cosmonauts have the traditional meeting with Korolev at the design bureau and hand over their flight logs. The new cosmonaut group is presented as well. Korolev is in a good mood, and makes an especially long-winded speech. Tereshkova has to leave early, at 12:00, to attend yet another press conference and a woman's congress. These activities kept her going until 22:00 in the evening - a gruelling schedule indicative of what was to come. 1963 June 29 - . Vostok 5/6 cosmonauts preparared for first international press conference. - . Nation: Russia. Related Persons: Bykovsky, Keldysh, Serbin, Tereshkova. Flight: Vostok 5, Vostok 6. Spacecraft: Vostok. At a meeting of the Central Committee, Tereshkova and Bykovskiy are taken through possible questions and correct replies by Serbin and Keldysh in preparation for their first international press conference. The training extends form 10 in the morning to 17:00 in the afternoon. 1963 July 1 - . Vostok 5/6 international press conference - . Nation: Russia. Flight: Vostok 5, Vostok 6. Spacecraft: Vostok. Big international press conference with the cosmonauts, beginning at 13:00. The session goes 1 hour and 45 minutes and all answers given by the cosmonauts are acceptable. After this conference they disappear from public view for seven days of medical examinations and monitoring. 1963 July 2 - . Yazdovskiy presses complaints about Tereshkova's performance - . Nation: Russia. Related Persons: Tereshkova, Yazdovskiy. Flight: Vostok 6. Doctor Yazdovskiy is insisting that Tereshkova is not being truthful about her flight experience. She handed out rations to on-lookers at the landing site in order to cover up the fact she did not eat enough during the flight. Kamanin considers the accusation a stupidity and indicative of the constant war going on between the flight surgeons and the cosmonauts. Tereshkova powerfully denies the accusation and defends herself well. Cosmonaut controversies - . Nation: Russia. Related Persons: Anikeyev, Filatyev, Nelyubov, Tereshkova. Flight: Vostok 5, Vostok 6. A fight ensues over the release of the motion picture film of the flight. The Kremlin leadership still does not want to show the 'secret' launch cadres, rocket and spacecraft configurations, etc. There is also conflict with the planned dismissal of cosmonauts Nelyubov, Anikeyev, and Filatyev, with the flown cosmonauts using their connections with the political hierarchy to try and overturn the decisions of their military commanders. Finally, Tereshkova started a campaign to get a posthumous Hero of the Soviet Union medal for cosmonaut parachute trainer Nikitin. This particularly irritated the military command since as far as they were concerned Nikitin died due to his own error and killed another parachutist in the process. In no way was this deserving of a medal, but the award would convey significant financial benefits to his family and Tereshkova fought on. This was indicative of the quick turnaround celebrity brought to the cosmonauts - from obedient junior officers, anxious not to lose a chance for a spaceflight, to aggressive campaigners, willing to take on even members of the General Staff for what they thought was right. 1963 July 7 - . Kamanin presses for specialised cosmonaut training - . Nation: Russia. Related Persons: Bykovsky, Rudenko, Tereshkova. Flight: Vostok 5, Vostok 6. In a two hour meeting with Rudenko, Kamanin attempts to convince him of the need for specialised cosmonaut training (qualifying as spacecraft commander, pilot, navigator, engineer, etc.) for future multi-crew spacecraft. Kamanin points out that in five to seven years they will be routinely flying 2 or 3 place spacecraft and need to start differentiating training now in order to be ready in time. However Rudenko remains unconvinced. Meanwhile Bykovskiy and Tereshkova are at the cosmonaut training centre, completing their flight reports. Kamanin faces difficulties in booking a hotel for the entire cosmonaut group in the Crimea in August --- he can't find any place with fifty vacancies, and concludes he'll have to split the group up. Pressure is coming from the Foreign Ministry for Tereshkova to make an early trip to Brazil, but she is already booked for two or three tours of friendly socialist countries beginning on 30 August and any additional trips can only be made after those are completed. 1963 July 10 - . Odintsev pressing criticism of Tereshkova - . Nation: Russia. Related Persons: Tereshkova. Flight: Vostok 6. Odintsev is still trying to formally criticise Tereshkova for her flight performance. He charges that she was drunk when she reported to the launch pad and while in orbit was insubordinate, disregarding direct orders from the Centre. Kamanin knows this to be absolutely not true. Both cosmonauts and workers at the cosmonaut training centre report that is impossible to work with Odintsev any more - they want him out. Korolev wants review of Tereshkova's flight performance - . Nation: Russia. Related Persons: Bykovsky, Korolev, Tereshkova. Flight: Vostok 5, Vostok 6. Kamanin discusses future cosmonaut book plans with writer Riabchikov. He is interrupted by a call from Korolev. Korolev wants Tereshkova and Bykovskiy in his office the following morning at 10 am sharp and he wants a full explanation for Tereshkova's poor self- samochuviniy on orbits 32 and 42, about her pvote, her poor appetite during the flight, and her failure to complete some assigned tasks. He blames Kamanin for providing her with inadequate training prior to the flight -- which Kamanin finds a joke since he had never received any support in the past from Korolev for his requests for more and better training of the cosmonauts in high-G and zero-G situations. Korolev had also never listened to any of Kamanin's complaints about the need to improve the living conditions for the cosmonaut on the Vostok spacecraft. 1963 July 13 - . Bykovskiy and Tereshkova take their first road trip - . Nation: Russia. Related Persons: Bykovsky, Tereshkova. Flight: Vostok 5, Vostok 6. Bykovskiy and Tereshkova take their first road trip, to Yaroslavl. It is clear that Tereshkova is the star and Bykovskiy is in her shadow. Bykovskiy calls Kamanin - he asks that his wife and Tereshkova's brother be allowed to accompany them on their first foreign trip. Kamanin rejects the request. 1963 July 16 - . Cosmonauts brainstorm improvements - . Nation: Russia. Related Persons: Gagarin, Tereshkova. Flight: Vostok 6. Gagarin is in the hospital to have his inflamed tonsils removed. A brainstorming session is held with the flown cosmonauts to identify problems encountered in flight and necessary improvements to training and flight operations to prevent them from reoccurring. The Military Soviet meets but the issue of Odintsev is not taken up -- his defenders in the hierarchy manage to suppress discussion of his removal. 1963 July 19 - . Cosmonaut tour plans through December 1963. - . Nation: Russia. Related Persons: Bykovsky, Tereshkova. Flight: Vostok 5, Vostok 6. Cosmonaut tour plans are firmed up for September-December 1963.. Tereshkova and Bykovskiy are to be given a gruelling schedule, having to visit Bulgaria, Mongolia, Italy, Switzerland, Norway, Mexico, India, Ghana, and Indonesia. .
1963 September 6 - . Tereshkova accused of a scandal in Gorkiy. - . Nation: Russia. Related Persons: Tereshkova. Flight: Vostok 6. The militia claims that Tereshkova was drunk and created a scandal with a militia officer in Gorkiy. She categorically denies being drunk, but does admit to having a confrontation with a militia captain. .
1963 September 7 - . Tereshkova and Bykovskiy begin an eight day tour of Bulgaria. - . Nation: Russia. Related Persons: Bykovsky, Tereshkova. Flight: Vostok 5, Vostok 6. 1963 September 30 - . Gagarin visits UNESCO. - . Nation: Russia. Related Persons: Gagarin, Tereshkova. Flight: Vostok 6. Gagarin visits UNESCO in Paris, followed by an interview with Paris Match. In the evening he and Kamanin visit Maxim's. On the same day Tereshkova departs for Cuba from Moscow. This is followed by a visit to Mexico. .
Nikolayev to wed Tereshkova. - . Nation: Russia. Related Persons: Nikolayev, Tereshkova. Flight: Vostok 6. Kamanin meets with Nikolayev to discuss the timing for his enforced wedding to Tereshkova. Nikolayev is evasive, doesn't want to set a date, won't give a direct answer. Kamanin points out the wedding will be the subject of a government decree and a precise date must be set. The possible days are limited due to Tereshkova's heavy travel schedule. Nevertheless Nikolayev refuses to commit to a date in October. 1963 October 9 - . Kamanin and Gagarin fly to Cuba to join Tereshkova. - . Nation: Russia. Related Persons: Gagarin, Tereshkova. Flight: Vostok 6. 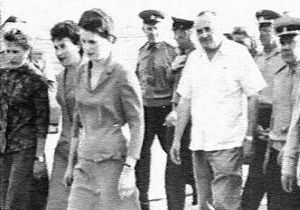 Kamanin and Gagarin fly to Cuba to join Tereshkova. Then over the next 13 days on to Mexico, USA, Canada, England, and East Germany. .
1963 November 21 - . Vostok 5/6 cosmonauts' Far East tour - . Nation: Russia. Related Persons: Bykovsky, Tereshkova. Flight: Vostok 5, Vostok 6. Spacecraft: Vostok. The cosmonauts are to depart on a Far East tour on 27 November, but scheduling is difficult because Sukarno calls to change the dates for Indonesia nearly daily. Kamanin develops four variant scenarios. The cosmonauts are to visit Sri Lanka, Burma, and Indonesia. Bykovsky achieved lunar flight duration - . Nation: Russia. Related Persons: Bykovsky, Tereshkova. Flight: Vostok 5, Vostok 6. According to a review of Bykovsky's flight log, Bykovsky could have successfully completed a circumlunar flight. Tereshkova would have tired on such a flight - she ate poorly and slept too much..